Players do not deposit money into a centralized Virtue Poker system. 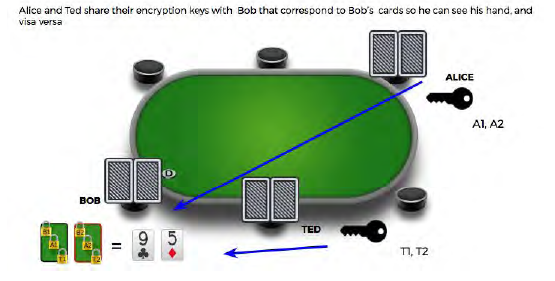 All gameplay happens using off-chain using a secure implementation of mental poker. All payouts happen in less than 60 seconds and are automatically sent back to a player’s digital wallet when they leave a table. application is downloadable and includes a shuffler, game engine, and user interface. each individual peer to shuffle the deck of cards. contract will auto-execute and payout each individual player when winnings are due. to sign-in via uPort each time they want to play games on Virtue. type, (4) reporting end game results. to other players at a given poker table. 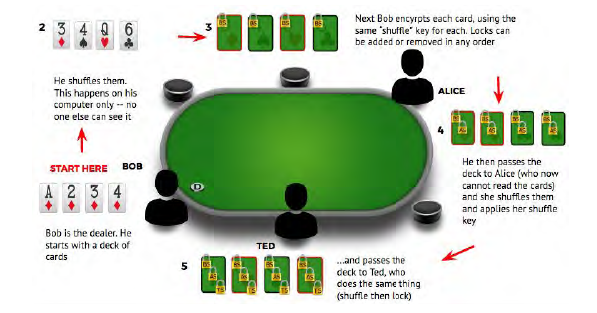 the user interface for all players at a given table displays the identical game state. at a later point in time for review either for compliance or for our game security team. 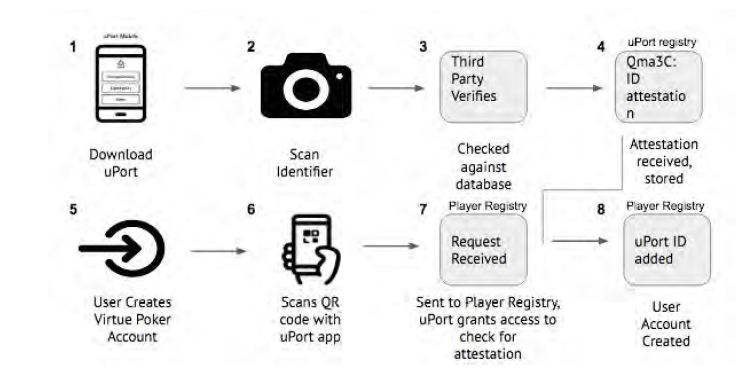 in IPFS, and the user receives an attestation within their uPort ID regarding their identity. ID which checks for an attestation from the third party that has verified the user's identity. stored in the Virtue Poker Player Registry. frontend, user, and game-management tasks. transfers any funds due to the same account from which the player originally paid them. of transactions sent to Ethereum to reduce our gas costs and improve gameplay speed. result is validated by the blockchain. the tournament that exist at a higher level than the table itself are handled by this contract. both keeping a registry of available Justices as well as for assigning them to the poker tables. upon the ideas, offering alternative methods, and providing analysis and critique. be difficult to manage and doesn't blend well with traditional server-based online game models. 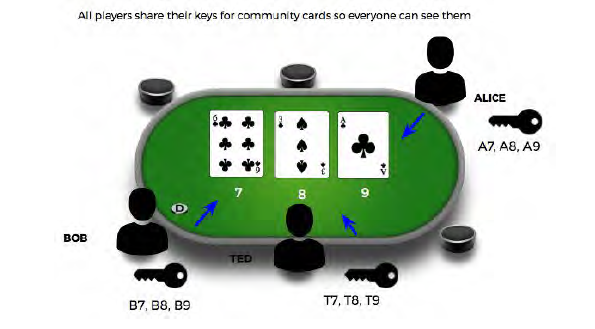 6-handed game at speed and manage real player stakes using the Ethereum Blockchain. any order. The basic algorithm is outlined in Section 3.5.2.
who goes through the same process. to Ted, who completes this same process. shuffled the deck properly then he can have confidence that the game is fair. experience players have come to expect with online platforms. technologies are required in order to provide a practical, consumer-oriented poker service. The downloadable game client software consists of separate "frontend" and "backend"
appropriate and passes it to the backend, which then broadcasts it to the other clients in the game. applying the same code to the same data as all of the others. impractical to use it to manage game events at a finer granularity than at the hand level. software itself, or more properly: by the software that manages the peer-to-peer "subnet"
client to verify that messages received have been sent by the claimed sender, preventing forgery. among clients, or peers at the table are resolved by Justices (described in Section 4.2). sending all of this log data to the blockchain is not practical. present in various forms of centralized storage systems. those savings to players and employ the lowest rake in online poker. initiatives, including partnering with affiliates. 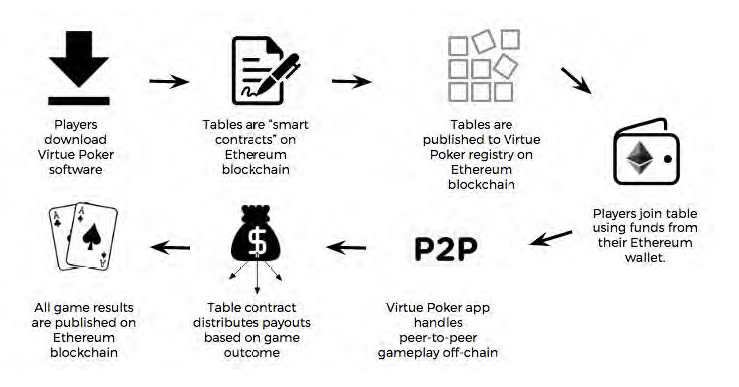 to showcase the Virtue Poker Platform. standards and our players are sufficiently protected. Our application currently is 13,000+ lines of code, and has been tested weekly since its inception. works on the Ethereum testnets. messaging protocol and hooks into Ethereum when peers create and join a particular table. Currently our application can play 6-handed and complete approximately 70-80 hands per hour. will implement a more industrial strength backbone. 51%-vulnerable consensus mechanisms cannot do. 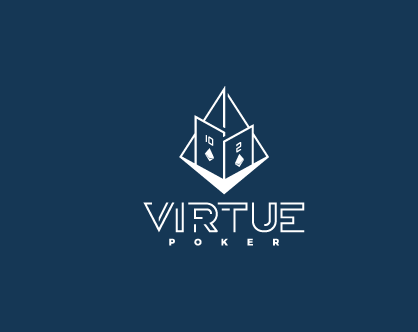 Virtue Poker will re-skin our current application and build out a user interface for our lobby. store hand archive using IPFS, and to add a reference to the data to the table contract. function much as it currently does - but it will communicate with the MTT contract. and to source feedback to improve upon our UI/UX. table Sit & Go’s and Cash Games. world to play on our platform. create a custom skin on our platform and to create games on top of our underlying infrastructure. Virtue Poker for the past two years. computer science and a master’s degree in web engineering . used by the operations team on a daily basis. enjoy it like a walk in the park. web has been the name of the game. billing services to laboratories, ACO’s, private practices, and hospitals. management company where he learned about Bitcoin and eventually Ethereum. online gaming: Delaware, New Jersey and Nevada. the longest established law firm in Gibraltar.